Tax Deadline Day – 31st January Every Year! As boring as it is, I’m afraid this is the same message as we do each year! If you have been asked to do a self-assessment tax return because you are a self employed sole trader, or because you have done one in the past, you MUST complete it by 31st January 2015 (and each year). Self-employed people, by law, must complete a tax return, even if they also have a PAYE employment. You should have informed HMRC of becoming self-employed (within 3 months of doing so) and they will expect a tax return from you. HMRC will have invited you to complete one. CIS construction workers will be owed tax back (usually) as they will have not only overpaid tax but will be able to claim certain expenses back against their tax. If that is you, get the tax return done or your rebate will diminish in fines and penalties and no-one wants that! Get in touch and we can help you beat the deadline, reduce the tax you pay and get a good refund back for you. If you are not sure whether this affects you, give Bettertax a call. We can help all tradesmen, whatever your employment status. We can also help and advise anyone that should be completing a tax return! 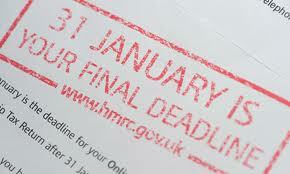 Home » Blog » Tax Deadline Day – 31st January Every Year!